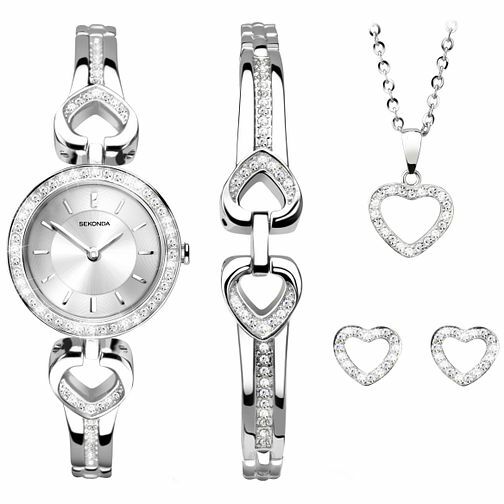 Get elegant matching style with this ladies' watch and jewellery set from Sekonda. The watch features a chrome coloured, stone set case and bracelet in an intricate heart style design, finished with a chrome coloured dial. The jewellery set is completed with a matching bracelet, heart shaped earrings and pendant, all stone set in the same design. Sekonda Ladies' Watch Bracelet Earring & Pendant Set is rated 5.0 out of 5 by 31. Rated 5 out of 5 by Anonymous from Lovely set I needed a silver watch.. this was a great watch Because it’s so beautiful. It is also very versatile So you could wear it formally or even everyday. The jewellery set is an added bonus really. I gave it To my daughter who loves it. The heart shape is very Endearing and the quality of jewellery is quite high as It’s very shiny and little stones sparkle a lot. It would make an excellent present as a whole for a loved One!